In New York, Mini has just finished introducing us to the 2015 Countryman. Not one to limit its attendance to just one major auto show, Mini decided to spread its new models out evenly by opting to introduce the equally refreshed 2015 Paceman in Beijing. Ok, maybe ’refreshed’ isn’t the right word to describe the 2015 Paceman because, well, there aren’t too many changes to begin with. It does adopt some of the changes made to the Countryman, but that’s not saying a lot. So, in essence, the 2015 Paceman’s biggest change is its a new model year. But it’s not the Paceman’s fault, nor is it Minis, for that matter. The Paceman, after all, was only introduced a few years ago, so a major refresh probably still isn’t in the cards until next year. More importantly, with the company’s expansion plans in full effect, Mini’s new-found lineup versatility has given rise to more choices for its customers. Other minor revisions to the exterior include what looks like a shorter hood, an elongated silhouette that comes by way of the flowing roof line, and the tapering side window graphic. Just like the five-door Countryman, the 2015 Paceman doesn’t come with a whole lot of noticeable changes, unless you count the three new color options Mini is offering with the new Paceman. The good news is that same Jungle Green shade we swooned over on the Countryman is also going to be available on the Paceman. Other minor revisions to the exterior include what looks like a shorter hood, an elongated silhouette that comes by way of the flowing roof line, and the tapering side window graphic. New standard and optionally available light-alloy wheels with reduced weight have also been made available. The 2015 Paceman does have an extra dose of high-end optional features, chief among them the new LED fog lamps with daytime driving lights and parking lights with LED technology. 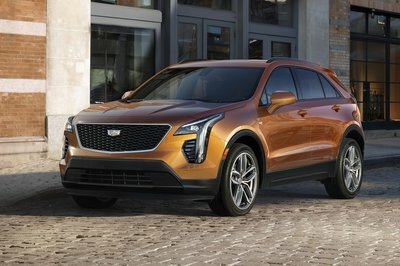 Xenon headlamps are also set to be offered, as well as adaptive turning light, comfort access, a glass push/tilt roof, automatic air conditioning, a removable tow hitch with a trailer load of up to 2,000 pounds. Outside of all that, the 2015 Paceman still looks like the Paceman. The dash and center console were untouched, although you do get the option of getting a sports leather steering wheel with shift paddles for automatic transmission or a multifunction steering wheel with cruise control. The interior of the Paceman remains relatively changed. The 2+2 seating configuration is still there, as is the center console tunnel that extends all the way to the back. The setup means that seating for five is out of the question, but the comfort in having your own bucket seat should make up for it. The dash and center console were untouched, although you do get the option of getting a sports leather steering wheel with shift paddles for automatic transmission or a multifunction steering wheel with cruise control. A Harman Kardon hi-fi speaker system has also been added, giving the Paceman a high-class audio system that should blend nicely with the classy and functional cabin. Finally, the interior of the 2015 Paceman offers as much as 1,080 liters (38.1 cubic feet) of load capacity, but that’s when the rear seats are folded. If those are upright, the space dramatically drops to just 330 liters (11.6 cubic feet). An optimal storage package can give you new places to stow your items, but it comes at the expense of adding functional elements on the center tunnel. 11.5 Cu. Ft. / 38.1 Cu. Ft.
1.6L Turbo for the S trim bumps the output all the way up to 190 horsepower, six ponies more than the 2014 model. 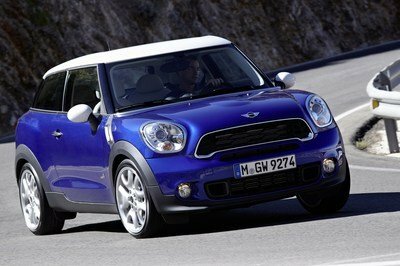 The 2015 Mini Paceman is set to be offered with a choice of engine configurations, even if each one of them is the same 1.6-liter displacement. The base 1.6L comes with 122 horsepower and 118 pound-feet of torque while the 1.6L Turbo for the S trim bumps the output all the way up to 190 horsepower, six ponies more than the 2014 model. As for the top-of-the-line John Cooper Works trim, you stand to get the same 1.6L Turbo with even more added juice at 218 horsepower. Naturally, the Paceman JCW is the fastest to 62 mph with the capability to do it in just 6.9 seconds. Top speed numbers haven’t been released, but we expect it to be somewhere close to 150 mph. Mini has yet to reveal pricing details for the 2015 Paceman so if you’re looking for an estimate, you can use the prices from the 2014 model. The base model Paceman was priced at $23,900 while the Cooper S Paceman opened at $27,500. The beauty of being the Nissan Juke, other than the fact that it looks wonky for a car of any size, is that it has the ability to cross over to a number of segments. You can line it up against a bigger crossover like the Subaru XV or you can line it up with another two-door model like the Mini Paceman. It’s an interesting comparison between the two models, largely due to the fact that both models come with a design unique to their own. 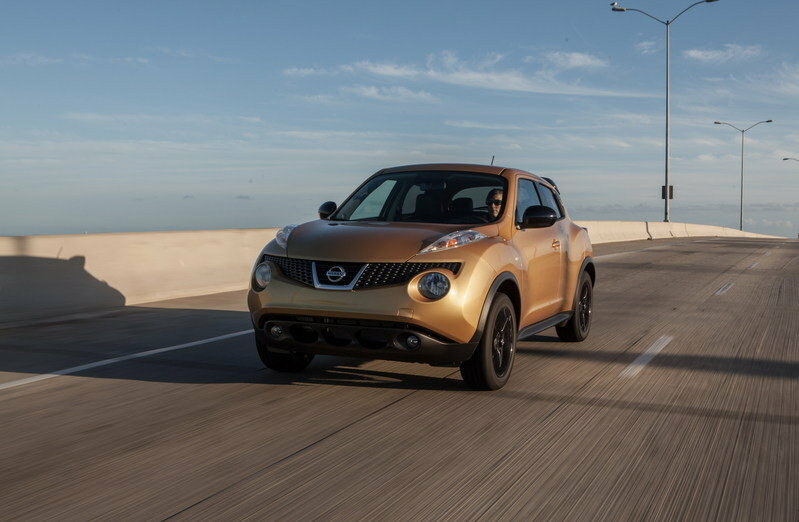 The Paceman may have the slight edge because of its German roots, but the Juke really isn’t that far behind considering the progress Nissan has made in its own brand of auto technology. Power might favor the Paceman, thanks to its myriad of engine options, but again, the Juke’s 1.6-liter inline-four engine that produces 188 horsepower is on par with what the Cooper Paceman S is capable of delivering. One other thing that swings the argument to the side of the Juke is its price. 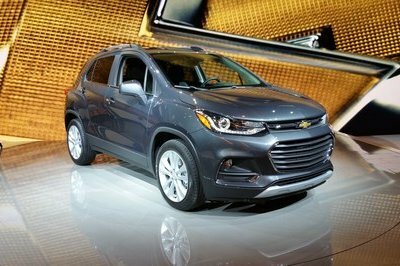 The base model is just under $20,000 and it has enough trims to choose from to make a purchase worthwhile. Even the top-of-the-line SL AWD retails for just under $26,000, slightly lower than the price we anticipate the 2015 Cooper S Paceman will have. The Audi Q1 gets honorable mention as a possible competitor to the Paceman, but the mere fact that the model isn’t even out yet casts some serious questions on whether it can really be true competition for Mini’s two-door small SUV. 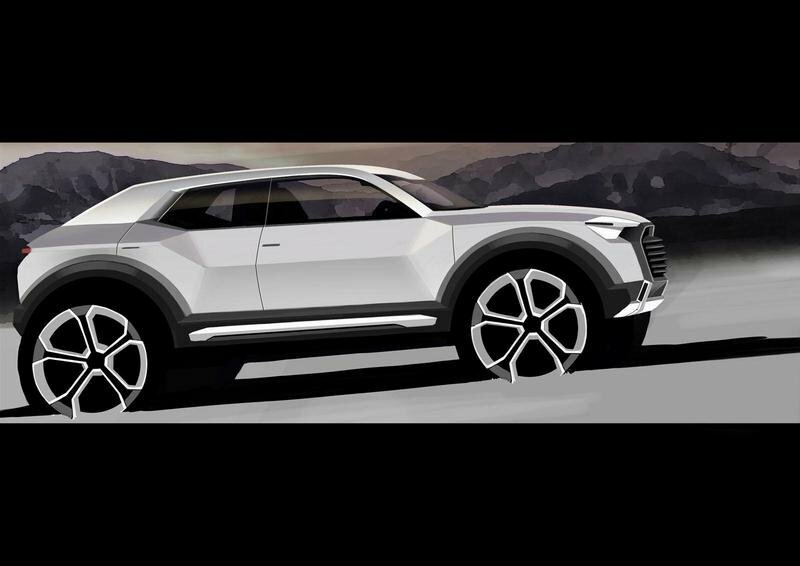 Audi has said the right things about the Q1 in the past, even divulging its prospective engine options: a 160-horsepower 1.4 TSI and a 140-horsepower 2.0 TDI. But until the Q1 hits the market, there’s little reason why people should wait for it when the Paceman is already out and about. The Mini Paceman gets the benefit of being a really unique vehicle. 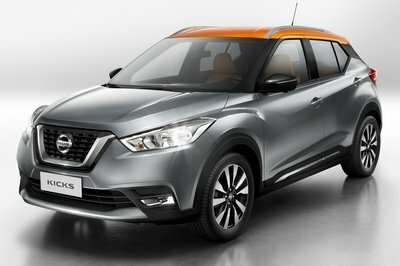 There aren’t that many stylish two-door SUVs in the market these days so the Paceman holds a pretty enviable position as being unique to the rest. That being said, we were disappointed to see Mini keep the 2015 Paceman relatively unchanged, with the exception of a few cosmetic options. But, hey, it’s still the Paceman and it still really catches your eye in a good way. For its price and all the options it has, you can really make a statement with the Paceman the likes of which you can’t do with other models. No room for five passengers? Fresh design, optimised aerodynamics and revised engines for first Sports Activity Coupé in premium compact segment. As the world’s first ever Sports Activity Coupé in the premium compact segment, the MINI Paceman has always offered athletic design and a sporty driving experience. 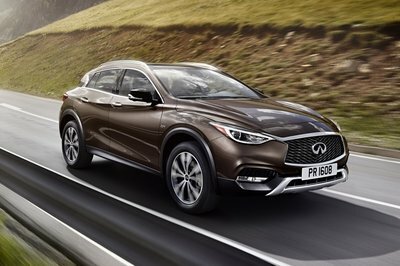 Now with the unveiling of the new version at the Auto China Beijing show, there is even more on offer to appeal to design-conscious customers. The new MINI Paceman boasts fresh design details and a sportier interior finish, while at the same time offering an optimised balance between driving performance and fuel consumption. The new MINI Cooper S Paceman is also more powerful yet more efficient than ever, with its engine developing an additional 190 hp. MINIMALISM technology contributes to reduced fuel consumption and emission figures in all other model variants, as well as enabling increased figures for acceleration, in-gear acceleration and top speed. 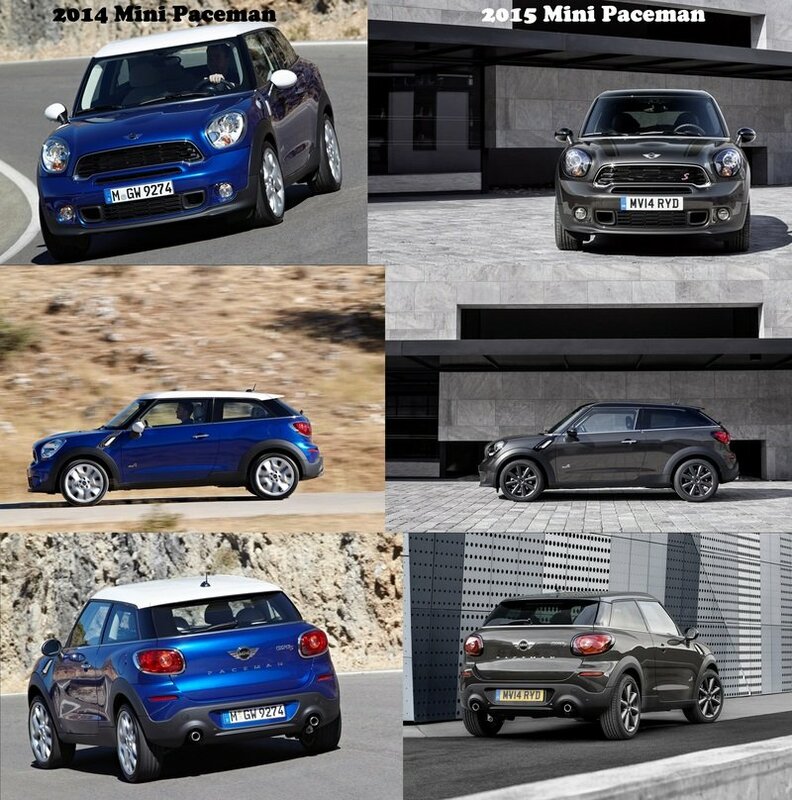 All variants of the new MINI Paceman meet the EU6 exhaust emission standard. The MINI John Cooper Works Paceman also joins the refreshed line up with an output of 218 hp and fitted with MINI’s ALL4 all-wheel-drive system as standard. Expressive design with fresh details. 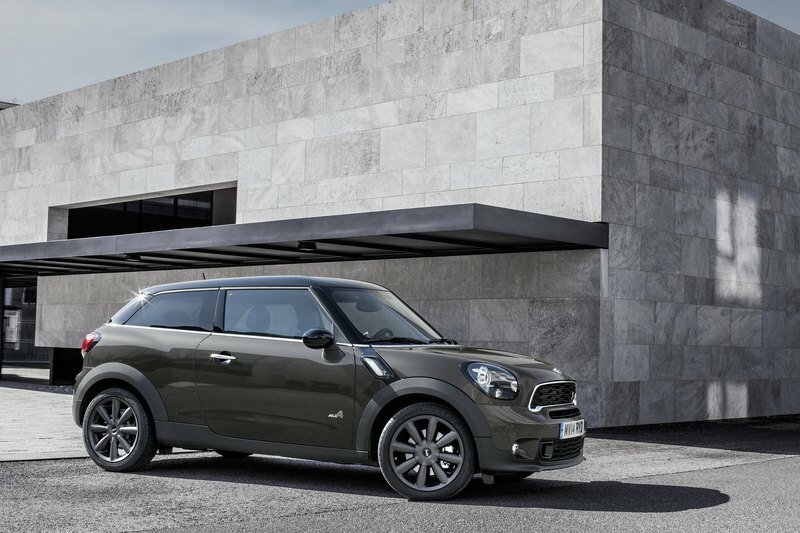 The innovative MINI Paceman includes a distinctive and highly expressive body design which embodies the properties of hallmark MINI design. The upright front section, with its large headlamps and hexagonal radiator grille contour, afford the Paceman a purposeful look, while the elongated silhouette reinforces its sportiness. Its distinctive character is also underscored by the rear lights which are horizontally arranged for the first time on a MINI. 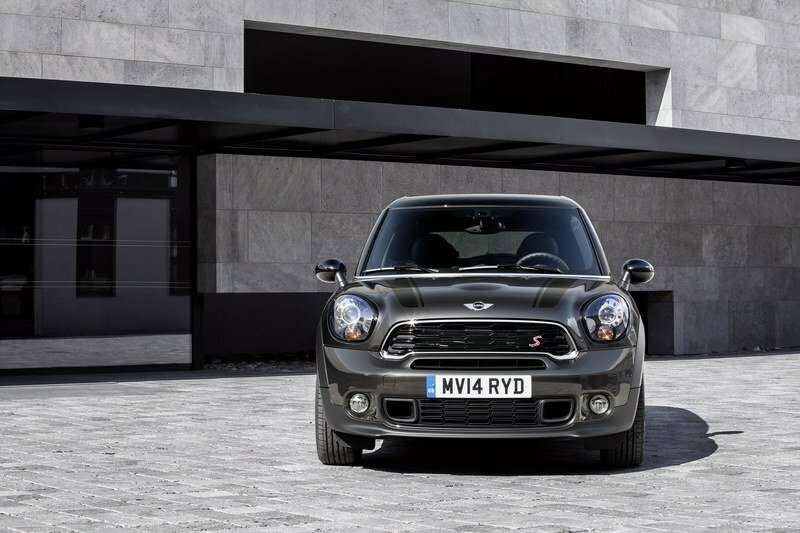 In certain models the radiator grille of the MINI Paceman now features a specific contour and grid structure. The new MINI John Cooper Works Paceman can be identified by a horizontal radiator grill rib in red, with the John Cooper Works logo positioned on the honeycomb pattern. The MINI Cooper S Paceman also features a curved ‘S’ in red on the front radiator grille. In addition to the coupé style doors, other striking features include the aggressively sloped roof which is available in a contrasting colour. The flowing roof line, falling off to the rear, and the tapering side window graphic create a stretched, wedge-like silhouette. The new Piano Black Exterior trim affords a high-end look to selected surfaces. It is to the surrounds of the headlamps and rear lights, on the diagonal links between the A columns and the front wheel arches and on the optional roof rails and the cross-rib in the radiator grill on the MINI Cooper Paceman. Chrome Line Exterior is also available as a no cost option. New colours for the MINI Paceman include Jungle Green metallic and Midnight Grey metallic. Black or white white contrasting roofs are available as a no cost option, while a contrasting Chilli Red roof is available exclusively for the MINI John Cooper Works Paceman. Sport and bonnet stripes are also available in various colours. New light alloy wheels with reduced weight and LED fog lights as standard. Light alloy wheels come as standard in all model variants of the MINI Paceman. Newly designed for the MINI Cooper and the MINI Cooper D Paceman , the 16-inch light alloy wheels in 5-Star ‘Air Spoke’ Design help increase the fuel efficiency of these models with their reduced weight and optimised aerodynamic properties. The 17-inch light alloy wheels in the new 5-Star ‘Triangle Spoke’ Design for the MINI Cooper S and the MINI Cooper SD Paceman are also lighter than their predecessors. They are also available in a two-colour design. MINIMALISM versions of these wheels are also available featuring tyres with reduced rolling resistance for reduced fuel consumption and exhaust emission levels. Meanwhile, the MINI John Cooper Works Paceman features 18-inch light alloy wheels in ‘Twin Spoke Black Burnished’ Design as standard. LED fog lights including parking and daytime LED driving lights are now standard across all MINI Paceman models. They provide an intense, bright white light with a much higher level of energy efficiency than conventional lamps. The structure of their light sources in full LED technology helps make the front view of the new MINI Paceman distinctively expressive. Optimised acoustic comfort, sporty flair and refined premium characteristics for the interior. The MINI Paceman is designed as a 2+2, with two sports seats for driver and front passenger and two individual seats at the rear offering excellent shoulder and head room, lateral support and comfort. The exclusive ‘lounge’ ambience of the second row is likewise enhanced by the armrests in the side rear trim panels. The new MINI Paceman benefits from acoustic optimisation which has reduced road noise against the outgoing model. 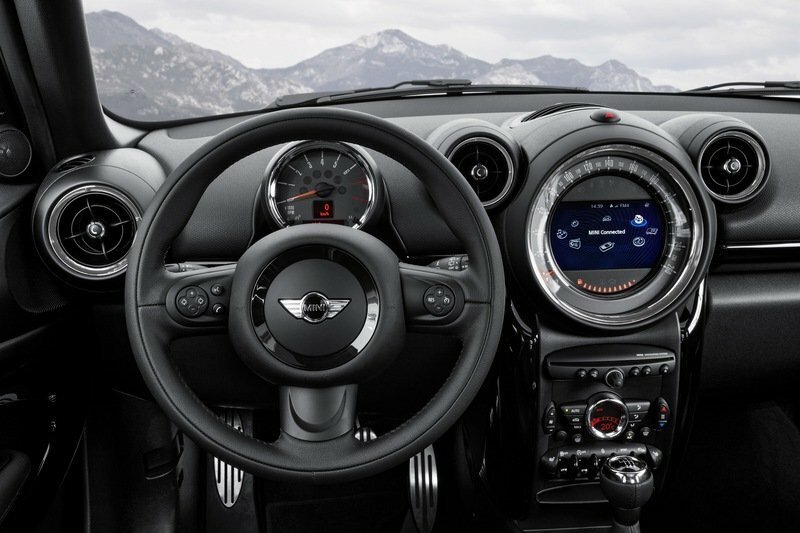 Adding to the sporty flair inside the cockpit, speed and display dials are now anthracite-coloured in the style of the MINI John Cooper Works Paceman across all models, while the John Cooper Works model bears the logo in the central instrument. The standard trim of the new MINI Paceman likewise includes chrome touches around the ventilation controls, clearly reflecting the car’s refined premium characteristics. Fast and efficient thanks to enhanced MINIMALISM technology. Numerous optimisations under the skin of the MINI Paceman contribute to a combination of increased driving fun with improvements in fuel economy and reductions in exhaust emissions. All petrol and diesel engines now meet EU6 exhaust emission standards. In addition, the high degree of efficiency of the modern four-cylinder power units and MINIMALISM technology ensure that the balance between driving performance and fuel consumption has been fine tuned in all engine variants. Measures applied to boost efficiency include optimised air ducting in the area of the underbody, wheel bearings with a lower friction coefficient and tyres with reduced rolling resistance. Increased power for the new MINI Cooper S Paceman further consolidates its leading position in the segment in terms of driving fun. Its four-cylinder spark ignition engine with twin-scroll turbocharger, direct injection and variable valve control sees power increase from 184 hp to 190 hp. MINI ALL4 all-wheel-drive system available across range. 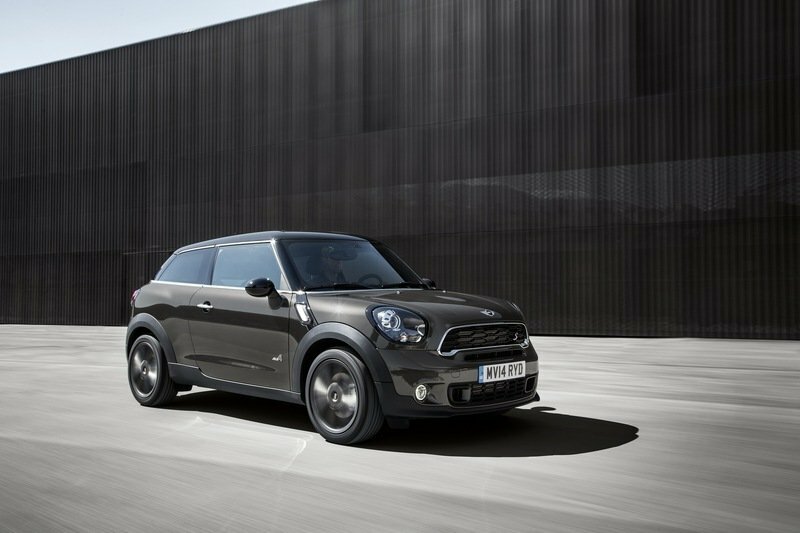 The MINI Paceman is the second model in the range to offer MINI’s ALL4 all-wheel drive system. MINI ALL4 distributes drive power at continuously variable levels between the front and rear axle by means of an electromagnetic centre differential and is available for all model variants. All MINI Paceman models can be combined with a six-speed automatic transmission instead of the standard six-speed manual. The automatic transmission offers the possibility of manual gear selection with Steptronic – including shift paddles. Fun, safety, comfort and networking at the highest level. The suspension technology of the MINI Paceman is of exceptionally high quality for the compact segment and in conjunction with its powerful engines contribute to the car’s impressive agility. Unmistakable go-kart feeling is guaranteed by the combination of McPherson spring struts and forged wishbones on the front axle, a multilink rear axle and electromechanical power steering. The integrated MINI safety concept comprises a crash-optimised body structure and a full range of features in the areas of active and passive safety. This puts occupant safety on the same level as the MINI Countryman, which was awarded the top five-star Euro NCAP crash test rating. 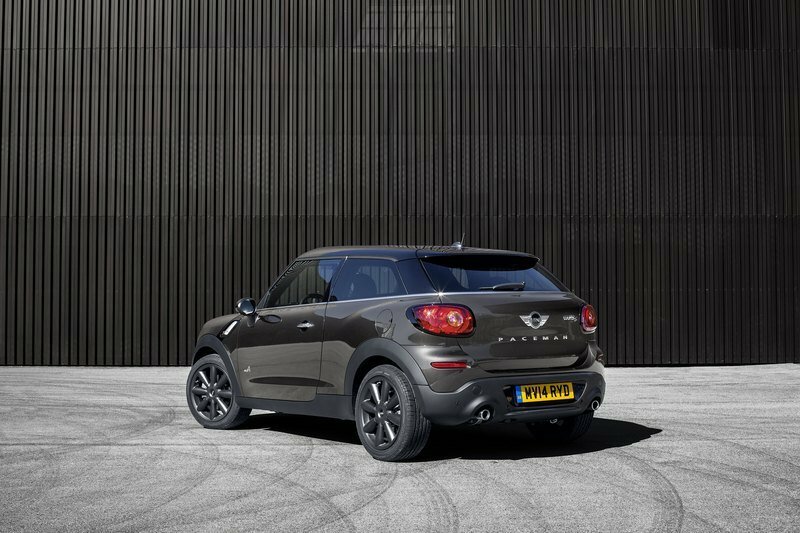 The new MINI Paceman is fitted as standard with daytime driving light as well as tyre pressure control on each individual tyre. Constant measurement of pressure means that the driver is given an early warning of potential loss in each tyre. Dynamic Stability Control (DSC) also forms part of the standard equipment of the MINI Paceman. DSC including Electronic Differential Lock Control (ELDC) is fitted as standard in conjunction with the ALL4 all-wheel-drive system in the MINI Cooper S, MINI Cooper SD and John Cooper Works Paceman. Generous standard equipment and wide range of options. An extensive range of optional equipment is available on new MINI Paceman. There are numerous upholstery types, interior colours, interior trims and Colour Lines to choose from. Bi-Xenon headlamps with adaptive turning, automatic air conditioning, comfort access, the electrically operated glass sunroof, a removable tow bar on some models with a trailer load of up to 1,200 kilograms, the MINI Navigation System, multifunction steering wheel with cruise control, Harman Kardon hi-fi speaker system and model-specific John Cooper Works accessories are all also available from the options list. Standard features include air conditioning, MINI Centre Rail between the front seats and a high-end radio system comprising CD player with MP3 capability, AUX-in socket, DAB radio, Bluetooth, five speakers and rear Park Distance Control. MINI Connected offers extensive smartphone integration. With MINI Connected, the British manufacturer emphasises its leading role in the intelligent networking of driver, car and the outside world based on cutting-edge interface technology. The integration of entertainment and online functions offered by modern smartphones helps make driving a MINI even more convenient and entertaining. It enables the use of vehicle-specific functions such as Mission Control, Dynamic Music, Driving Excitement and MINIMALISM Analyser as well as online-based services. Integration of third party apps into the car is available with MINI Connected, with additional functionality being added on an ongoing basis. Current functions include web radio, the use of social networks such as Facebook, Twitter, foursquare and Glympse, RSS news feed reception and entertainment programs such as AUPEO!, Stitcher, Deezer, Audible, Napster/Rhapsody and TuneIn. Operation is intuitive and typically MINI in style via the on-board computer in the central instrument, the MINI Joy Stick in the centre console, the multifunction buttons of the steering wheel and also voice control.